This book discusses the issues involved and so enables you to make your own informed decision. Do you see yourself as a linguistic diehard or a trendy radical? Are you more afraid of being mocked for ignorance or of being laughed at for pedantry? How far should we worry about offending people by our choice of words? In You Can't Say That! English Usage Today, the author takes the reader on an enlightening and often amusing journey. 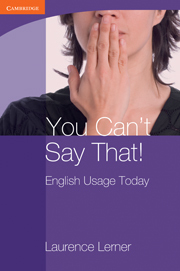 Unlike other books on English usage, which simply tell you what's right and what's wrong, You Can't Say That! discusses the issues and so puts you in a position to make your own informed decision. Laurence Lerner, retired professor, novelist and poet, surveys topics as diverse as language change, Standard English, grammar, register, euphemism, political correctness and the consequences of English becoming a world language.